Hello my friends, and happy Friday! 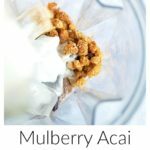 I’m so excited to bring you this simple and such an extremely delicious dairy-free mulberry acai milkshake! 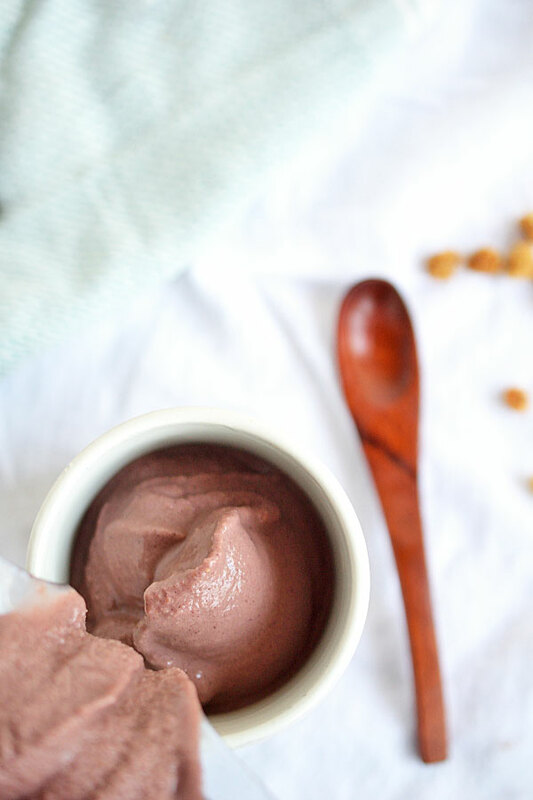 Only 5 ingredients, nutrient-dense, smooth and creamy, sweet with just a hint to of chocolate, and so, so rich without any dairy. I was very blessed to have been sent a few products by Anthony’s Goods that I will be featuring/reviewing over the next few week. 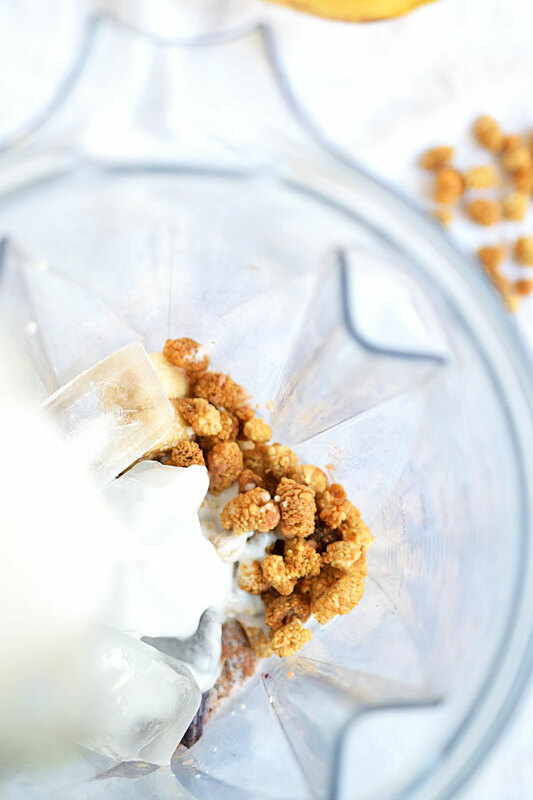 Today I’m bringing you a super yummy milkshake recipe with their sun-dried white mulberries. These tasty mulberries are certified USDA organic, non-gmo, free of sulphur dioxide and additives, and (one of my favorite things) are sun-dried. The flavor is so sweet, with that hint of malty flavor, and they have a chewy texture. This shake would fool all yall into thinking there was actually dairy milk and ice cream. That pairing of the mulberries with acai, and a bit of cacao power to bring out the naturally chocolatey notes of the acai, is so spot on. A little reminiscent of a frosty with that malty/chocolate flavor, but much more depth- and talk about nutrient-dense with the added acai and fruit! The blended mulberries lend themselves beautifully to that creamy, thick richness of a milkshake that the frozen bananas create. With those two ingredients as the base, you can throw in just about anything and you’d come out with something awesome! But with this one, I’ve added the pure acai and just a hint of raw cacao powder. Throw a little ice in there and some homemade coconut milk, and you’ve got yourself an amazing and healthy, dairy-free milkshake! You can’t add too many mulberries, the more you use, the more of that sweet somewhat malty flavor. Although the cacao powder is not necessary, it does complement the mulberries and acai very nicely. However, it is still delicious without, or add extra for a real chocolatey flavor! Create the consistency of your liking with the amount of liquid. Start with enough liquidvin the blender to get things moving and then stream in additional while blending until you reach your desired thickness! Add less to create more of a soft-serve ice cream, or more for a smoothie-like consistency. 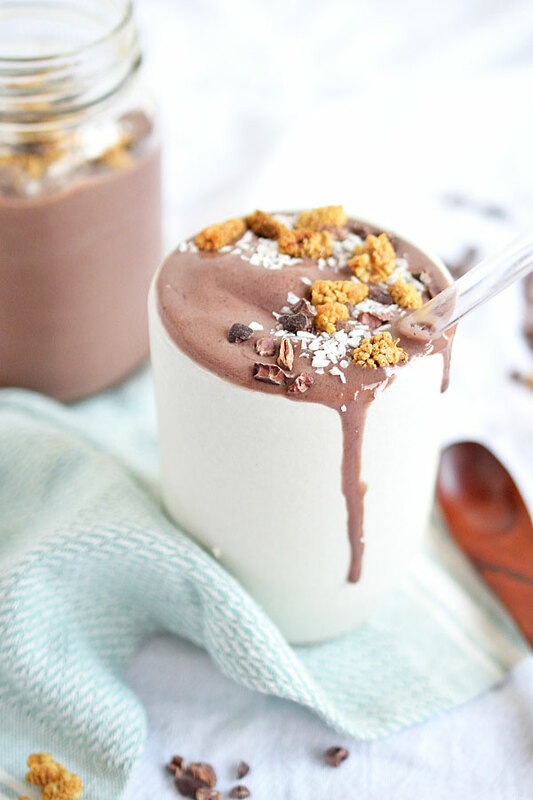 A dairy-free, but oh-so-creamy mulberry and acai milkshake. Full of nutrients and flavor! Toppings: mulberries, raw cacao nibs, shredded coconut, etc. 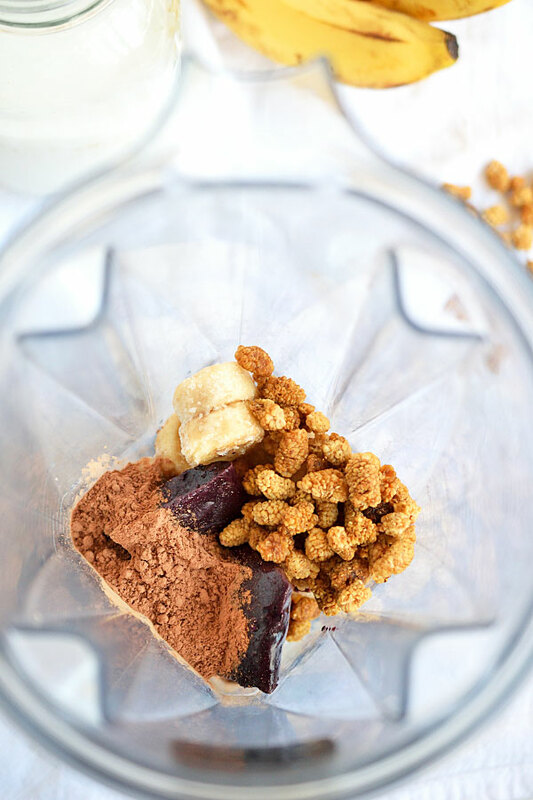 Place frozen banana, dried mulberries, and acai in a high-powered blender. You'll need about 1 banana per serving, so begin with 2 bananas-worth of frozen slices. Add enough mulberries to be anywhere from 1/4 - 1/2 the amount of banana used, depending on preference, or even more if desired. To this, add the frozen acai, about 1/2 packet per serving, and a few spoonfuls of cacao powder if using. Lastly, add about equal amounts ice to frozen banana used and enough coconut milk to come halfway up the ingredients. Blend the ingredients on high for about 30 seconds, adding additional coconut milk if needed to help with blending until you reach desired consistency. Pour in glasses, add toppings of choice, and serve with a straw and/or spoon. I use homemade coconut milk, but any store-bought/homemade coconut or other nut milk will do. It does taste pretty amazing with the acai especially. This was my first recipe made with processing the mulberries in some way. I typically leave whole, but I love them like this!